It was fifty years ago, today, on a cold and stormy day, that BC Ferries first began service. Two vessels, the MV Sidney and MV Tsawassen, operated from the Tsawassen ferry terminal on the mainland (Vancouver) side, and the Swartz Bay Terminal, on Vancouver Island, near Sidney BC. The company reports that they ended the year turning a profit, and that was just the beginning. 50 years later, the company has 36 vessels, 47 destinations and up to 4700 employees. You can read more about BC Ferries’ history from the company’s website. To celebrate, BC Ferries is giving away a “gold wrapped chocolate” gift to all customers going through the ticket booths. You can join the discussion over at West Coast Ferries; the local media has a interesting tidbits list of 50 years of BC Ferries and the Vancouver Sun has a bit more of a business point of view of the birthday. 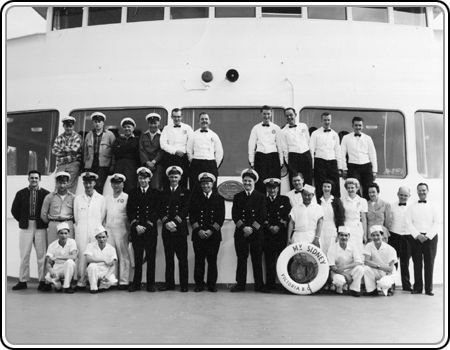 Pictured below, is the original crew of the MV Sidney, in 1960, from BC Ferries’ archives.